Natura Cafe is an all-day café in the Dream Downtown hotel in Chelsea. It's from the team behind the nightclub Tao. The California-themed menu features acai bowls, toasts, salads and tuna poke. Breakfast, Lunch & Dinner daily. Natura Cafe, Dream Downtown, 355 W. 16th St., New York, NY 10011, 646-625-4825. Restaurateur Reno Christou, who is behind Kyma Flatiron, has opened Eléa, a Greek restaurant on the Upper West Side. The open dining room boasts exposed white-washed brick, while the menu offers dishes such as seafood risotto, whole grilled fish, and red wine braised short rib. Dinner nightly. Eléa, 217 W. 85th St., New York, NY 10024, 212-369-9800. Undercote is a bar and lounge underneath Simon Kim’s Korean barbecue restaurant Cote in the Flatiron District, right next to Cote's underground dry-aging room. Undercote offers a “one-of-a-kind” Champagne list, playful cocktails from Sondre Kasin, and complimentary snacks (although there is no food menu). Undercote, 16 W. 22nd St., New York, NY 10010, no phone. Lower East Side restaurant There, with its glass veranda and laid-back vibe, offers a menu of small and large plates. Look for options like shrimp with broccoli purée and honey walnuts, duck confit with Gruyère and cornichon powder, and côte de boeuf for two. There, 154 Orchard St., New York, NY 10002, 917-388-2814. As part of the RH (formerly known as Restoration Hardware) New York store in the Meatpacking District, the RH Rooftop Restaurant features crystal chandeliers, marble tabletops and beautiful views, plus an outdoor terrace. The all-American menu includes a French dip, truffled grilled cheese and a lobster roll. Lunch & Dinner daily. RH Rooftop Restaurant, 9 Ninth Ave., New York, NY 10014, 212-217-2210. Mission Chinese Food, the restaurant from chef-owner Danny Bowien, opened a new location on Johnson Avenue in Bushwick, Brooklyn. This outpost is awash in neon lights that change colors during the night. The menu includes green tea noodles, fried lamb neck and kung pao pastrami. Dinner nightly . Mission Chinese Food, 599 Johnson Ave., Brooklyn, NY 11237, 718-628-3731. Ruby's Vintage Harlem is named for Ruby Dee, the artist and activist who once lived in the building. The wine and cocktail bar serves small plates in a sleek, modern space. Dinner nightly. Ruby’s Vintage Harlem, 2340 Adam Clayton Powell Jr. Blvd., New York, NY 10030, 212-234-1833. Michael Vignola and Rachid Abdelouahad's midtown restaurant Pomona is named after the mythological goddess of fruit, the harvest, and abundance. The menu features dishes like Hudson Valley foie gras sliders, a black truffle chicken hot dog, potato and mackerel terrine, and Bordeaux-poached filet mignon. Pomona, 8 W. 58th St., New York, NY 10019, 212-753-1200. Eleva Coffee company has opened its first coffee bar, which serves its single-origin brew plus house-made pastries. Open daily. Eleva Coffee Bar, 178 N. 8th St., Brooklyn, NY 11211, no phone. In a 150-year-old former bowling alley, Harlem Ale House serves more than 100 types of beer, plus burgers and fajitas. Harlem Ale House, 101 W. 127th St., New York, NY 10027, 646-692-8412. The new flagship of Morgenstern’s Finest Ice Cream, on the corner of Houston Street and LaGuardia Place, is four times the size of the original. The ice cream shop will offer 88 flavors available in cone or pint form at five scooping stations, plus pies, cakes and sundaes. Morgenstern's Finest Ice Cream, 88 W. Houston St., New York, NY 10012, no phone. SoHo's Frankie Goes to Bollywood is all about Mumbai’s famous street food, the frankie, which is griddled flatbread stuffed with savory fillings like spiced potatoes or paneer. The Totally Tikka features tandoori chicken, sweet peppers and tomato-fenugreek curry and the Outrageous Okra highlights crispy okra, apricots and kale. 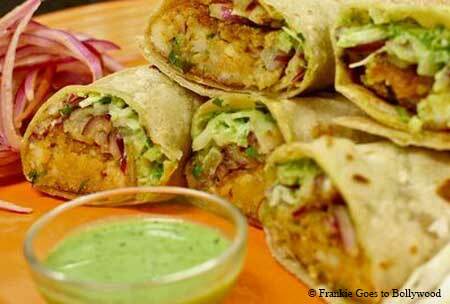 Lunch & Dinner Mon.-Sat.. Frankie Goes to Bollywood, 204 Spring St., New York, NY 10012, 646-869-1600. Located at Innside New York Nomad, all-day restaurant The Wilson specializes in seafood, like crispy oyster sliders, a fried fish sandwich and blue crab carbonara. Also served is a "Garden Margarita" with Milagro tequila, avocado, poblano pepper, bell pepper and lime. Breakfast, Lunch & Dinner daily. The Wilson, Innside New York Nomad, 132 W. 27th St., New York, NY 10001, 212-529-2671. Financial District restaurant Brooklyn Chop House (it's in Manhattan, despite the name) offers steakhouse favorites like burgers and steaks, plus Chinese dumplings and entrées such as beef and broccoli and fried rice for two. Lunch & Dinner daily. Brooklyn Chop House, 150 Nassau St., New York, NY 10038, 212-619-1200. Partners Harris Salat and Rick Horiike employ "sushi robots" to make rolls at Bigeye Sushi, their fast-casual spot in downtown Brooklyn. Bento boxes, bowls and salads are also available. Lunch & Dinner daily. Bigeye Sushi, 2 MetroTech Center, Brooklyn, NY 11201, 347-599-0188.